Making decanter centrifuges and other sophisticated equipment easy. 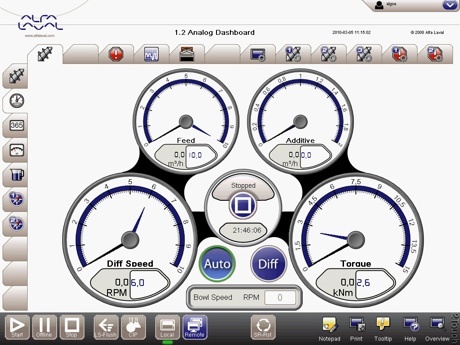 The new iX from Beijer Electronics helps Peter Blomberg and his automation colleagues to create a graphical interface that makes decanter centrifuges and other sophisticated equipment from Alfa Laval as easy to use as today’s mobile phones. The user-friendly interface is appreciated by customers, as well as the new HMI solution saves time and money in installation and service. Australia – it says on the consignment note of decanter centrifuge just being packed into a large wooden box. High quality is one of the reasons why the machines from Alfa Laval´s production plant in Søborg, (DK), are exported successfully to all over the world. 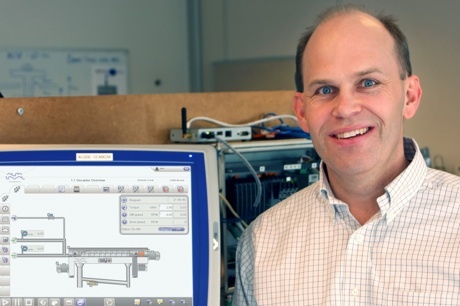 Peter Blomberg has been three years as automation manager at Alfa Laval. He explains that the company puts a great pride in producing reliable and cost-effective machines with a long life time. The strategy also includes that their machines must be easy to use: ‘The goal is to make our machines just as intuitive to use as today’s personal computers and mobile phones’. After arrival and installation at the Australian buyer, the decanter is operated from a Beijer Electronics 15-inch touchscreen panel. In order to function even in dusty and damp industrial environments, the panel is fitted with an IP67 seal at the rear. Simplicity in the operation of machines is both a selling point and a quality issue for Alfa Laval. And the latest tab-based graphical user interface 2Touch, created with the help of the iX Developer, is in perfect line with the fundamental intentions. ‘The idea is that all information should be readily available when it´s needed’. By pressing a finger at any of the tabs on the screen, the operator open menus to see operational data, adjust parameters, acknowledge logged alarms or maybe change the menu language. Yellow labels for each choice, explain the different hand grips. On the screen, icons to start, pause and stop, has the same symbolic language as on the DVD player in your living room. A few clicks on the screen are enough to browse through the electronic manual that describes the machine, or to see an instructional video. Alfa Laval is without doubt inspired by more consumer-oriented products and is now in the lead with increased ease of use. Peter Blomberg is clear on why this effort has been made. ‘HMI solutions with different colored push buttons and cryptic text messages on oversized screens belong to yesterday’. While the simplicity is quite obvious, he is open about the challenges to get this far. The decision to update the automation platform, while creating the new graphical operator environment was taken before the launch of iX – Beijer Electronics’ largest and most ambitious development effort. ‘By starting in an early stage, we have not only gained a unique knowledge, but also a significant advantage over our competitors’. Already more than fifty models of the new generation of decanters with the new user interface have been delivered to customers globally. Decanter centrifuges are not the only machines equipped with 2Touch: ‘Other types of machines in our three product areas (heat transfer, separation and fluid handling machines) will be upgraded to the new platform’. Although there have been teething problems to overcome, He does not regret that Alfa Laval was early with iX. The decision was well founded. The project began with nine intensive month´s evaluation of more than a dozen different HMI concepts. ‘No other vendor could offer the same features and graphic possibilities within the framework of an open architecture’. Alfa Laval has customers and employees spread all around the world. Another important issue in the selection was also the fact that Beijer Electronics is a well established and globally active company with a strong focus on technology. The development tool iX Developer is a well structured tool for configuration and documentation. Deeper HMI experience is not necessary to create a basic application in the Windows environment – something that actually does not need to take more than a few minutes. Existing projects can be reused. In addition to this, Beijer Electronics also offers a range of ready-made and tested icons and modules. Companies, unlike for example Alfa Laval, who does not want to create custom icons, can benefit from the comprehensive component library’s standard set. ‘We have put a lot of work to customize the interface to our visual identity’, says Blomberg, ‘who among other things appreciates the vector graphics capability to create crisp, clear images at any magnification’. In addition to openness and graphics, the flexibility speaks for iX. He notes that the HMI solution works with most control systems. This is unlike the competitors that were evaluated, where the link between HMI and PLC products often were very dense. ‘Although we are currently using controllers from B & R, the flexibility is crucial to us. Customers may have existing control systems or requests for other PLC brands or industrial computers’. The support for OPC, provide completely freedom to choose communication protocol. This is significant in cases where Alfa Laval’s products are integrated with equipment from other suppliers in the same process line. Switching between different protocols is actually possible in real time. The decanter centrifuges touch panel facilitates not only the operator’s work through improved overview of the process. The technology shift is also an advantage for Alfa Laval’s technicians: ‘End-users are satisfied and at the same time as we obtain simplified installation and maintenance services,” according to Blomberg , “time is money, if a machine fails’. Today Alfa Laval’s engineers reach all functions and information via the operator panel. It is no longer necessary, as before, to connect a laptop by cable for troubleshooting. Updating a machine’s system software is as easy as to put a memory stick in panel USB connector. The ability to monitor and address the machine or process line remotely via modem is another plus value. ‘With an aesthetically pleasing HMI solution that works today and has a modern feel in the years to come, we have reached our goal’, he summarizes. Operator panels with 2Touch make even other machines from Alfa Laval easier to manage. In addition to separators and decanters, other products for cooling, heating and fluid handling belongs to the company’s range of bestsellers. Decanter centrifuges consist of a rotating screw conveyor that separates solids from liquids. The basic idea is the same as in Gustaf de Laval’s classic separator which for more than one hundred years ago formed the foundations of the company. Alfa Laval has over the years evolved into a publicly held global company with 11.500 employees, twenty production units and a turnover of around 26 billion SEK. The decanter is adapted to different process environments by varying the design, height, etc. The difference between a decanter and a separator is the ability to separate out larger particles. Application areas include everything from dewatering of sludge in sewage treatment plants to food and oil production. RTU products supports remote communication such as IEC60870, IEC61850, SNMP, Modbus. Invensys Operations Management will host a series of international events focused on enabling Operational Excellence with innovative technologies and strategies. OpsManage’10 kicks off in North America at the Peabody Orlando hotel in Orlando, Fla., October 18 to 22. Additional OpsManage’10 conferences will be held November 8 to 10 in Sydney, Australia; November 17 in Tokyo, Japan; November 24 in Seoul, Korea; December 2 in Taipei, Taiwan; November 16 and 17 in Paris, France; and December 1 and 2 in São Paulo, Brazil. The event series will be a multi-discipline educational experience that will give attendees an in-depth look at how the company’s InFusion Enterprise Control System (ECS) enables new opportunities for Invensys clients and partners to deliver Operational Excellence across four key areas: Control, Asset, Productivity and Environment & Safety. The latest open technologies and collaborative business models will be explored, along with the role of Invensys’ industry-leading Avantis, Eurotherm, Foxboro, IMServ, SimSci-Esscor, Skelta, Triconex and Wonderware brands, all components of the InFusion ECS, the world’s first enterprise control system. This year, the OpsManage’10 Expo area will host a wide variety of Invensys ecosystem partners who will present methodologies and solutions expertise for achieving Control, Asset, Productivity and Environment & Safety Excellence. Industry-specific presentations will showcase manufacturing, energy, infrastructure, products and software experiences, and attendees will be able to participate in hands-on demonstrations of Invensys Operations Management and partner solutions. Additional detailed product and application training opportunities are also offered as part of the conference agenda. As global sponsors, Microsoft and Cognizant will be on hand to discuss the results of co-innovation between Invensys, other Invensys partners and Invensys customers using their latest technology and services capabilities. The events will include educational sessions covering asset management and effectiveness, mobile solutions, safety practices, manufacturing intelligence, process automation and energy management. Forums focused on specific vertical industries, including food and beverage; mining, metals, and minerals; facilities management; power; water/wastewater; upstream oil and gas; hydrocarbon processing; pharmaceuticals; and chemicals, will also be featured. Keynote speakers in Orlando will include Chris Trimble, business innovation expert and author of Ten Rules for Strategic Innovators from Idea to Execution, and Sudipta Bhattacharya, chief executive officer and president of Invensys Operations Management. Rarely before has political opinion been so unified on one specific environmental issue… the UN Climate Change Conference in Copenhagen was a failure. Ian Hamilton, Technical Director of Human Engineering, the human factors and ergonomics consultancy of the Lloyd’s Register Group. Ian is a Chartered Psychologist who believes that psychology can help us to understand climate change scepticism. Lloyd’s Register Quality Assurance (LRQA) is a member of the Lloyd’s Register Group. Lloyd’s Register is an independent risk management organisation that works to help improve its clients’ quality, safety, environmental and organisation performance throughout the world, because life matters. Human Engineering is one of the world’s leading human factors and ergonomics consultancies, with offices located throughout the world. The company’s human factors specialists (psychologists and ergonomists) understand people, their physical attributes and their behaviour, and these skills are employed to support the design of equipment and systems to improve safety, health and performance. As politicians seek to apportion blame for the summit’s inability to reach a binding agreement on emissions reduction, observers should look beyond the politicians – global climate change scepticism could have been the greatest barrier to success. According to The (London) Times only 41% of people in Britain think that climate change is largely man-made, and even more worryingly, only a quarter of those surveyed think it is a serious problem. The newspaper suggests that this demonstrates a failure on the part of politicians to persuade the public, but do politicians manipulate public sentiment or merely reflect it? Recently, Bjorn Lomborg, The ‘sceptical environmentalist’ wrote in The Spectator that even the environmentally friendly Australians rate the problem as less serious and pressing than they had previously. Indeed their new opposition leader Tony Abbott has been very out-spoken in opposition to climate change action. Surprisingly, in the notably sceptical United States, despite the urgings of many high profile deniers such as Sarah Palin, as many as one third of Americans think that humans have made a contribution to climate change. This is fewer than in Britain, but not by much. So why do a majority refuse to accept the overwhelming evidence that climate change is happening? (See Elizabeth Kolbert, Field Notes from a Catastrophe: Climate change – Is time running out? published by Bloomsbury in 2006.) And why do so many people prefer to believe that humans are blameless? Simplistically, by rejecting the notion of man-made climate change, an individual may feel absolved of responsibility. If he or she sees climate change as a myth, or even if they accept it but regard it as a natural change, they can argue that there is nothing to be done. People in the West seem to regard their use of energy as an entitlement to continue with business as usual, rather than accepting a responsibility to conserve. The consumptive practices of people in our society lies at the root of carbon emissions. Businesses will always act to meet market demands, and politicians seldom actually influence opinion; they merely represent what they hope will be the views of their constituents and if levels of climate change scepticism are running high, it would be unrealistic to expect our political leaders to reach agreements that would disenchant their domestic voters. If we want to see real change in emissions levels, we will have to influence the minds and deeds of voters. In Copenhagen, much of the debate centred on financial instruments and emissions targets that would have enormous financial implications. At the same time, proponents of technological solutions, such as Bjorn Lomborg, argued for investment in environmental technology. However, it will be difficult for either or both of these solutions to succeed without the hearts and minds of the majority of voters. People cause emissions through their insatiable use of energy, but it is important to appreciate that energy consumption is essential to life as we know it and people will have to want to change rather than having change forced upon them. But how can that be achieved? Surely people read the papers; they watch the news; hasn’t the message been delivered clearly enough already? So maybe clarity is not the only criterion. The Lloyd’s Register Group has built an unparalleled worldwide reputation for helping organisations to reduce risks and protect people and assets. In order to achieve this, it has been necessary to develop a deep understanding of how humans behave and the insight that this provides can help us to understand climate change scepticism and thereby to find ways to deal with it. Psychology has a great deal to offer in terms of understanding how and why people think and behave the way they do. It has taught us that behaviour is motivated and influenced by our core beliefs and attitudes. In fact the success of Cognitive Behavioural Therapy (Stephen Briers, Brilliant Cognitive Behavioural Therapy: How to use CBT to improve your mind and your life, published by Prentice Hall in 2009.) rests on the very principles that express how our attitudes and perceptions give rise to thoughts and emotional responses. Thoughts cause emotions and emotions cause thoughts. What this tells us is that behaviour will not change unless we accept the rationale for change at the level of our core beliefs and in a way that allows our emotional reactions to be consistent with these beliefs. Core beliefs are not simply rational, evidence-based concepts. They are a mixture of attitudes and emotions that are usually reinforced by a subjective and convenient interpretation of the ‘facts’. The healthy mind needs core beliefs; they anchor our personality and guide our behaviour. When there is a deviation between core beliefs and behaviour we can experience stress and anxiety. If unchecked this can lead to depression and other forms of mental ill health. In fact there are inbuilt defence mechanisms to nudge us back and to keep behaviour and beliefs aligned. Cognitive dissonance arises when we have conflicts between thoughts and behaviour. This is a feeling of unease about the inconsistency, and it can be experienced as anxiety, anger, guilt, or even shame. Such negative emotions are unpleasant and so there is an automatic motivation to reduce them. Take a simple, everyday example: You buy something that you believe to be a bargain only to discover that you have paid too much. As a rational person you don’t want to think you have been misled or swindled, so you seek to diminish the feelings of foolishness or annoyance by creating a rationale for the decision: the shop has better after-sales service, or the sales person was attractive, etc. That way you can acknowledge the ‘mistake’ but justify it in terms that allow your self esteem to remain intact. We are all governed by our sense of identity and our desire for a certain lifestyle. If we expect people collectively to change to a more sustainable form of living we need to help them by making the arguments connect with their motivations and sense of self. The conditions for behavioural influence are strongly affected by the emotional salience of arguments. Some of the resistance to climate change arguments arises from the fact that much of the information people receive comes from a media perceived to be alarmist and politicians who are distrusted. In addition, people perceive the risks to be distant in time and in place – change will take decades and if it does come, it will only affect other countries. Local impacts should be emphasised more strongly. In addition, the perception of the effects of climate change is also affected by our belief in the impact of action; people fail to see how local action can help with a global problem. Most people see governments and others as more responsible for dealing with the consequences of climate change and many adopt a subjective position, somewhat selfishly refusing to take action until other people do. Perhaps the most significant reason for the denial of man-made climate change is that the arguments for it have less emotional salience than the arguments against. The arguments for man-made climate change are typically presented in the statistical and qualified language of science. This may be technically correct but lacks emotional impact and may not be accessible to all. Scientists do not, generally, resort to scare tactics; in contrast the arguments of denial are charged with emotion. They often include unfounded claims such as the ‘greenies’ want to stop you having fun in your SUV, or green taxes will lead to greater unemployment. The arguments against man-made climate change also exploit in-group/out-group prejudices. Action on climate change is portrayed as ‘lefty’, radical and reactionary. Most Britons are (small ‘c’) conservatives who prefer compromise and moderation rather than major change. They also seize on any equivocation in the scientific message (such as the recent email leaks) to demonstrate the ‘weakness’ of the scientific case. So it is easy to see why the case for denial appears to be winning. Climate change scepticism is emotionally attractive; if there is no climate change or if human behaviour is not involved, then current lifestyles can be maintained free from guilt. It is necessary to connect with the personally emotive aspects of the arguments in order to help people to accept personal responsibility for action on environmental issues. If psychology and a deeper understanding of human behaviour and emotions are employed in the promulgation of messages for positive action to mitigate climate change, then acceptance of the need for action could become the majority view. If the sceptics become the minority, the work of the politicians will be greatly simplified and they will become empowered to make the decisions that are necessary to prevent serious climate change and the Copenhagen Summit may, in the future, be regarded as a success. Following a request from a manufacturer of concrete products, Applied Measurements has developed a user-friendly, low-cost device to rapidly and accurately measure tension in pre-stressed wire and cable. In addition to our comprehensive range of ‘standard’ transducers, we also have the capability to design, develop and manufacture custom devices to meet specific needs. Our expertise is based on bonded strain gauge technology, which is carried across our complete line of transducers. Our involvement in your project can be at any stage, from development and design, through prototypes, testing and into full production. To rapidly and accurately measure the tension within pre-stressed steel wire or cable using a repeatable process that will serve to increase the confidence of the end product. To manufacturers of concrete products, the ability to make these measurements using a simple process that removes operator uncertainty from the measurement is paramount. This was the challenge set to Applied Measurements, by Bison Concrete. Bison is one of Britain’s leading producers of structural, pre-cast concrete products. Consistent, quality control is vital to maintain the company’s position at the forefront of the sector. The company is particularly renowned for pre-stressed elements, including hollow-core floors, solid composite floors and beams. This development was prompted by a customer asking for a non-contact method for determining the tension in reinforcing cables and bars for pre-stressed concrete beams. Peter Lewis, the managing director of Applied Measurements investigated the dynamics of the measurement and discovered that a vibrating steel wire or bar would have on an externally applied transverse magnetic field. After significant development the ‘Digiforce’ was born and the patented device has now been supplied to many other concrete manufacturers’ including RMC, Concrete, Tarmac, Spiroll Precast, Coltman Precast, Milbank in Britain, Burns in the USA and Impact in Australia – and other blue chip construction companies all who share the need to make rapid and accurate tension measurements on-site. The equipment used for this tensioning process must be tested on a regular basis, but current methods are cumbersome and time-consuming and accuracy is in part dependent on the skill of the operator. The Digiforce developed by Applied Measurements has enabled Bison to achieve rapid, repeatable, non-contact tension measurement using cutting-edge technology. Integral to the durability and structural performance of these products is the correct tensioning of the pre-stressing steel tendons. There are approximately 30 tendons in the average 1200mm-wide hollow-core floor slab, which may be up to 160m in length. By striking the wire or cable under tension and observing their fundamental natural frequency of vibration, it has proved possible to develop a battery powered hand held instrument capable of accurately determining the tensile forces applied to them. Although simple in theory, the low frequencies – Hz to a few tens of Hz and complex sound spectra have up to now, prevented their accurate analysis on-site. The Digiforce addresses this issue via the integral mathematical software, to process only those frequencies of interest that contributes to the measurement. This means that the user no longer has to refer to look-up charts or return to the office to run complex calculations pertinent to that piece of equipment or installation. The instrument is first programmed with the length of the wire or cable whose tension is to be measured. Also inputted is its weight per unit length. The magnetic sensor at the end of the instrument is then placed adjacent to the part to be measured. The measurement process is triggered and the part is struck lightly with the mallet supplied. After a few moments, the tension appears on the LCD display on the instrument. Tensions in stainless steel or other non-ferromagnetic wires can be measured by attaching clips (also supplied) made of ferromagnetic materials, provided that their masses are insignificant compared to that of the cable to be measured. The vibrations being analysed are complex and the fundamental frequencies that the method uses are in the range 3Hz to 70Hz and not the metallic note heard by the ear. The tension is determined from the formula, T = 4 x length2 x Hz2 x weight per unit length. Because of the very low frequencies, tuned circuit filter methods are not an option. Instead, the device makes an initial 20 measurements of each oscillation and discards these. The next five measurements from 10 oscillations are then used to establish a tolerance band to establish which measurements are reasonable to contribute to the calculation and which should be rejected as spurious. Subsequent measurements are then made and those that fall within the tolerance band are used to calculate the final measurement value. Because the principal business of Applied Measurements is in designing and manufacturing precision load cells and force sensors, the measurements are traceable back to NPL calibration standards. The Digiforce boasts an on-board data-logging facility for collecting results and an RS232 port / USB converter for later downloads to a host PC, driver software, aluminium striker, rugged carrying case and full instructions. Additionally the device is supplied with a 3-year warranty. Following the success of the Digiforce in pre-stressed concrete, other applications are now being realised. One such success story is Stage Technologies in London, who use the product to monitor the loading on cables used to support various stage elements. Emerging Company Award in the Automation and Control System Services in the EMEA market. The 2009 Frost and Sullivan Emerging Company Award has been presented to Adroit Technologies for its distinct competence in catering to exact customer requirements in the EMEA (European, Middle East Africa) automation and control system services (ACSS) market. Having created a unique identity in the Southern African market, the company is now emerging as a strong participant in the European ACSS market. Adroit develops SCADA and HMI software for major process and discrete industries and has a diverse product offering specific to end-user requirements. The company’s aim to focus varied market segments and expand its customer base globally has forced it to take a leap, which has started yielding profitable results. opportunity of working closely with its customers. Started as a software producer for the SCADA/HMI and Reporting products the company is now focused on offering its VIZNET Information Portal product. Recognised by Microsoft, VIZNET is a software platform that answers the age old challenge of collaboration and content delivery of data, information and knowledge through a single Smart Client User Interface. The real-time mine operations management portal built by partner Polysphere was also based on the VIZNET product. Distinctive advantage of VIZNET Information Portal introduced by Adroit in 2008 helps in retrieving the real-time data and combines it with the MIS, MES and ERP information. It presents these data in the reporting structure through a single-user interface. The wizard driven and visual configuration makes development and maintenance of any application quite simple. The security model, built on Microsoft’s active directory offers clients peace of mind when using the smart client connectivity over the internet. The Frost & Sullivan Award for Emerging Company is presented each year to the company that has emerged as a significant participant within its industry. This company is perceived to have exhibited outstanding management, superior market growth, exceptional customer service and the ability to combine technology and successful strategic initiatives. This company has the exceptional know-how to take advantage of market changes through the execution of innovative strategies within the existing competitive landscape. participants, customers, and suppliers, along with extensive secondary and technology research. The companies’ efforts are then analyzed based on the number of new customers, new segments, and commitment to business expansion coupled with market growth. The company is introducing the advanced alarm management product and a version 3 of VIZNET in May 2009. Knowing the fact that innovation is the key factor to compete in the dynamic market, Adroit invests close to 30 percent of its revenues in the research and development (R&D) activity annually. This has helped the company to survive even in the toughest period of economic slow down to have 30 percent growth in 2008 compared to the previous year. Adroit achieved this with a strategic approach where it focused on end users who were working on single-vendor approach. Adroit catered to these companies with its maximum benefits and at reduced cost. Adroit is a clear market leader in Southern African delivery in the latter half of 2008, Adroit added additional features to its maximum demand agent product which assists large companies in energy management. This product calculates the predicted maximum demand in any one metered period allowing demand side management to be carried out. This has helped the customers to limit the usage of power and electricity which had been the need of the hour. As reduced energy and fuel consumption can bring significant cost saving in the industry environment, Adroit is taking relentless efforts towards achieving this. Their major end-user segments are the water and the mining industries, some of the energy efficiency projects in which they participated in recent years were DBS Mines, PPC cements and Johannesburg Water plants. With global expansion plans and clear focus on the target customers Adroit emanates its products with utmost efficacy. Participation in various industrial tradeshows, conferences and road shows has provided more visibility to the company. Some of the recent trade shows in which Adroit participated are CEBIT in March 2009, The Durban Control Road Show in March 2009 and SCADA & INDUSTRIAL AUTOMATION CONFERENCE in March 2009. In the process of educating its customers, they frequent training programmes to the new, existing and advanced users of Adroit’s products. These courses last for 4-5 days on regular basis and customers can gain maximum knowledge out of these programmes, which would equip them to have a thorough understanding of Adroit’s products. Having understood the need for expertise in the automation field, the company has started training the engineering students for a competitive future. Adroit’s corporate governance policy equips the students to gain expertise in the automation field and also provides qualified workforce to the company. Various other activities such as providing sponsorship for sports persons are also a part of the activity, which Adroit carries out for the public welfare. Adroit has installed close to 13,000 SCADA/HMI systems within EMEA and in the international market across different end-user segments such mining and water and wastewater after having understood the customer requirement completely. Adroit is concentrating more towards intelligent devices which aims at distributed process control and multifunctional communication protocols, providing customer friendly environment in the plants. The company works with reliable distributors who are also value-added resellers and systems integrators. This has provided Adroit more scope to clearly penetrate geographies such as Great Britain, Belgium, Italy, Poland, Canada, Australia, Thailand, New Zealand, South Korea and Malaysia with its capable partners in these geographies respectively. Adroit’s wider customer base extends to the following end users such as pulp and paper, food and beverages, petrochemical, pharmaceutical, cement and many others. Its serves more than 5000 clients and holds a strong presence in the South African market and is emerging as an efficient participant in the European automation market, handling most of the state-owned water and utilities projects. Apart from the process industries, the company is increasing its customer base in the telecommunication and the building management segments. It is also planning for global expansion by 2010 by partnering with the major automation companies. Adroit’s key strength lies in understanding the exact customer demand and catering to it without any deviation. Being an emerging participant in the EMEA market, the company has created clear visibility for its products. In the dynamic automation market, Adroit is witnessing a stable growth as a result of multiple partnerships and value-enhanced offering. The strategic focus towards market expansion and diversified end-user segments is making Adroit an emerging participant in the automation and control system services market. 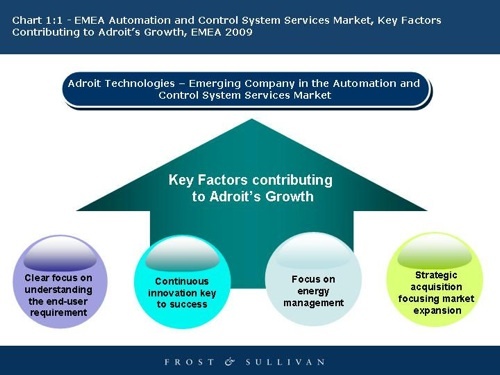 These factors make Adroit Technologies the deserving recipient for the 2009 Frost & Sullivan Emerging Company Award in the Automation and Control System Services in the EMEA market.